J. R. Hind discovered asteroid #22 Kalliope. J. Palisa discovered asteroid #301 Bavaria. J. H. Metcalf discovered asteroid #736 Harvard. M. Wolf discovered asteroid #845 Naema. G. H. Peters discovered asteroid #886 Washingtonia. M. Wolf discovered asteroid #1053 Vigdis. L. Oterma discovered asteroid #1540 Kevola. The United States controversially imported 88 German scientists under "Operation Paperclip" to help in the production of rocket technology. NASA launched Saturn-Apollo 3, the third suborbital test of the Saturn I rocket. Saturn-Apollo 3 (Saturn C-1, later called Saturn I) was launched 16 November 1962 from the Atlantic Missile Range. The upper stages of the launch vehicle were filled with 23,000 gallons of water to simulate the weight of live stages. At its peak altitude of 167 kilometers (104 miles), four minutes 53 seconds after launch, the rocket was detonated by explosives upon command from the ground. The water was released into the ionosphere, forming a massive cloud of ice particles several miles in diameter. By this experiment, known as "Project High Water II," scientists had hoped to obtain data on atmospheric physics, but poor telemetry made the results questionable. The flight verification tests, however, were all met. The flight was the third straight success for the Saturn C-1, and the first with maximum fuel on board. 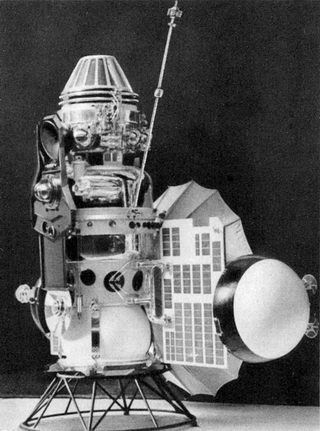 USSR launched Venera 3 toward Venus, the first spacecraft to land there. Helmut Zborowski (21 August 1905 - 16 November 1969) was an Austrian rocket engineer, designed liquid rocket motors and an expert in anti-tank missiles. Zborowski received over 300 patents in the air and rocket industry. After the Nazis took over, Zborowski joined the SS but continued his research. He contributed to development of the V-1 cruise missile and V-2 ballistic missile. Zborowski was Director of the camoflauged BMW facility at Muenchen-Allach where aircraft engines were mass produced using a total of 20,000 workers, including 3,000 POWs and 5,000 inmates from the Dachau concentration camp. Zborowski also supervised a rocket group at the facility which concentrated on new weapon research. In January 1947, he was detained at POW Camp 317, Goettingen. After being released, Zborowski was taken by the French to do research at a chateau near Paris, then brought back to Bonn. NASA launched the Skylab 4 crew of three astronauts from Cape Canaveral, Florida for an 84-day mission. Harvard College discovered asteroid #2076 Levin. The first attempted intentional interstellar radio message was transmitted from the Arecibo telescope towards globular star cluster M13, approximately 25,000 light years away. NASA's STS 5 (Columbia 5, Shuttle 5) landed at Edwards Air Force Base, California, completing the first "operational" Shuttle flight, which deployed Canada's ANIK C-3 and Satellite Business Systems' SBS-C commercial communications satellites. NASA STS 51-A (Discovery 2, Shuttle 14) landed at the Kennedy Space Center, Florida, after deploying TELESAT-H (ANIK) and SYNCOM IV-1, and retrieving PALAPA-B2 and WESTAR-VI. Russia launched Mars 96, which failed to leave Earth orbit and re-entered the atmosphere. The Mars 96 spacecraft was launched 16 November 1996 into Earth orbit, but failed to achieve insertion into Mars cruise trajectory and re-entered the Earth's atmosphere at about 00:45 to 01:30 UT on 17 November 1996 and crashed within a presumed 320 km by 80 km area which includes parts of the Pacific Ocean, Chile, and Bolivia. The cause of the crash is not known. The Russian Mars 96 mission was designed to send an orbiter, two small autonomous stations, and two surface penetrators to Mars to investigate the evolution and contemporary physics of the planet by studying the physical and chemical processes which took place in the past and which are currently take place. The Mars 96 Orbiter was a 3-axis sun/star stabilized craft based on the Phobos design with two platforms for pointing and stabilizing instruments. The propulsion units were mounted on the bottom, and two large solar panels extended out from opposite sides of the craft. The two penetrators were mounted on the bottom by the propulsion system, the two small stations were connected on top of the spacecraft, and a dish antenna extended off one of the sides perpendicular to the solar panels. The Mars 96 spacecraft had a launch mass (including propellant) of 6180 kg. Mars 96 was scheduled to arrive at Mars on 12 September 1997, about 10 months after launch, on a direct trajectory. About 4 to 5 days before arrival the small surface stations would have been released. The orbiter was to go into an elliptical 3-day transfer orbit about Mars, and the two penetrators to descend to the surface during the first month of orbit. The final orbit would have been a 14.77 hour elliptical orbit with a periapsis of 300 km. NASA's ill-fated Genesis solar wind sample return spacecraft arrived at the Sun-Earth L1 point and went into a halo orbit around it. NASA's X-43A Scramjet set a new speed record for air-breathing vehicles, reaching nearly Mach 10, flying 7000 mph. NASA's X-43A research vehicle screamed into the record books (again) on Tuesday 16 November 2004, demonstrating an air-breathing engine can fly at nearly 10 times the speed of sound. Preliminary data from the scramjet-powered research vehicle show its revolutionary engine worked successfully at nearly Mach 9.6, or 7,000 mph, as it flew at about 110,000 feet.